This is the story of a young boy and his cat, Emperor Falafel. Or maybe it's a story about Salty Pete the Pirate? No. It's definitely about a taco truck-loving dinosaur. Or maybe it's about vikings? In Whose Story Is This, Anyway? our young narrator gets increasingly agitated that other storybook characters are horning in on the story he is trying to tell about his life and pet cat. Of course, what our young narrator fails to realize (at least at first anyway) is that pirates, dinosaurs, aliens, vikings, and robots showing up unexpectedly in your life makes for quite a riveting story. 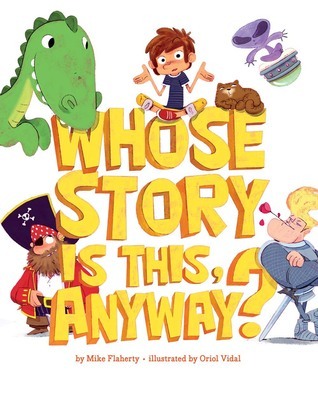 This would be a fabulous mentor text to share with students about how the story or piece of writing your intended to write might not be the piece you end up with -- and why that's perfectly OK!